The Samoyed breed of hounds is one that is quite playful, energetic and affectionate. They are friendly when they encounter strangers in their territory and they tend to be extremely patient and get along well residing with other pets in the home. They make exceptional watchdogs and have been previously utilized as such more often than any other reason. They possess a tendency to get into trouble when they are left alone without any mental stimulation and may not be very easy to train as pups. They are stubborn and can be set in their ways often, and also enjoy being somewhat independent at times as well. They enjoy being around children so much so that they tend to herd little ones at times. The Samoyed are natural diggers and have a reputation to bark some days also. 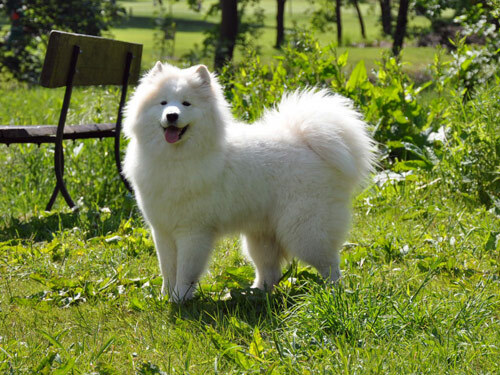 The Samoyed breed is one that enjoys exercising each day. This means they will strongly desire to go for a long walk each day or have the freedom to roam and play outdoors for a good portion of the day if their owner's schedule obliges them to do so. They are pullers and adore being in the cold weather. They can easily reside outside, even in colder climates with very maintenance. They are friendly creatures and prefer to be around their families most of the day if possible. They bode a very thick fur coat that will need cared for during the week by brushing their coats. In the shedding season, they will need even more care for their coats. The Samoyed breed only runs into CHD issues from time to time, and not every dog of this type has this issue. Some other concerns may be having an overactive thyroid gland, gastric torsion and common eyesight problems. In rare occurrences, the Samoyed breed can run into PRA and some can result in a diabetes diagnosis as well. Some screening tests the vet may recommend is for their hips, eyesight, thyroid gland and DNA or PRA testing also. The average lifespan for this type of dog is from ten to twelve years long. The average weight for this animal is anywhere from thirty-five to sixty-five pounds as adults. Descending from Russia, the Samoyed breed was a nomad favorite. They had the ability to pull loads, even people on sleds in very frigid temperatures. Helping to herd reindeer, they also guided to hunt bears and steer their herd clear of any predators that crossed their paths. They also had an unusual responsibility of keeping little ones warm and cozy at night when the climate was very cold. Making their way to the United Stated in the very early 1900's, they began to grow in popularity as sled dogs. They are still popular as household pets and many enjoy them for dog shows for their beautiful appearances as well. In the past they have also been referred to as the Samoyedskaya breed also, and is known for their gentle and sweet personalities.